While InSight closed in on the Red Planet and NASA and the Jet Propulsion Laboratory (JPL) focused on getting that lander down on the surface safely in November, the Mars Exploration Rovers (MER) team, working with operators at the Deep Space Network (DSN), spent the month continuing to search for a signal from Opportunity. Despite a host of false alarms, the rover that shattered virtually every robot record on Mars, completed the first-ever marathon on another planet, and is the longest-lived Martian explorer remained silent, presumably still sleeping at her site halfway down Perseverance Valley, along the western rim of Endeavour Crater. This is a false color version of the panorama Opportunity was working on right up to a few sols or Martian days before the planet-encircling dust event (PEDE) caused the robot field geologist to shut down and enter a sleep survival mode in June 2018. From the black areas, it’s clear the rover has some work to do. MER follower James Sorenson processed this image. By day, Sorenson works as the CAD-CAM designer and computer numeric controlled (CNC) machinist at a family owned business that develops high performance polyurethanes and composite epoxy materials. In addition to processing MER images, he devotes his spare time to long exposure deep-space astro-photography and 3D printing. “I hope when or 'if' Opportunity wakes up, that she could continue to finish it,” he said. The MER team agrees and has a long list of other science investigations on the proposed docket for the world’s beloved rover. The end of November marked 173 days since the MER team has heard from its rover. The last downlink received from Opportunity arrived June 10, 2018, and the minimal amount of data the rover returned revealed the planet encircling dust event (PEDE) was blotting out the Sun in a way the mission had never before experienced, reducing the solar-powered rover’s energy to the lowest ever recorded on the mission and forcing the ‘bot to shut down and enter into a kind of hibernation mode. Along with the team, countless thousands of followers around the world have been waiting too, hoping that Opportunity will phone home soon. 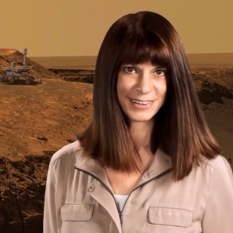 “We miss her,” said MER aficionado, author, and astronomy outreach educator Stuart Atkinson, who has been blogging about the rover’s mission for the last decade. Although it’s been five and a half months, the sound of silence was still not all that surprising to members of the MER operations team and they have not lost hope, not yet. The mission’s long history on Mars indicates the dust-cleaning season that comes every Martian summer has begun, and that gave the team a sense of renewed optimism that in coming weeks their rover will be gifted with gusts of wind that will clear some of the accumulated dust on the solar arrays and enable the ‘bot to recharge her batteries, power up, and phone home. With the approval of NASA headquarters in late October, the MER operations team continued its two-pronged strategy to make contact with the beloved veteran robot field geologist throughout November. The strategy includes what JPL mission operations engineers call sweep-and-beeps, a procedure of actively listening and searching for the Opportunity’s signal multiple times a day during the mission’s assigned time slot on the DSN, on both wavelengths of the signal on which the rover may be trying to communicate. If they find their ‘bot’s signal and can lock on it, the engineers would then command or ‘nudge’ the rover to respond. The Space Flight Operations Center at the Jet Propulsion Laboratory (JPL) in Pasadena, CA, pictured here, is where mission engineers and scientists communicate and keep track of their spacecraft via NASA’s Deep Space Network (DSN), the only international network of antennas that provides communication links between Earth and Mars. The network is comprised of three communications facilities placed approximately 120 degrees apart around the world: at Goldstone, in California's Mojave Desert; near Madrid, Spain; and near Canberra, Australia, a strategic placement that allows for constant observation of spacecraft as the Earth rotates on its axis. Additionally, the team continued listening passively for Opportunity on “virtually every DSN track” from Mars, as MER Project Scientist Matt Golombek put it, using the network’s highly sensitive Radio Science Receivers that record all signals from Mars at the network’s sites around the world. Meanwhile, the sky over Endeavour cleared a bit more; the MER thermal team ran some new simulations that showed the Martian temperature at Opportunity’s site is not so cold that the rover is in imminent danger of having to turn on her heaters; and the High Resolution Imaging Science Experiment (HiRISE) camera onboard the Mars Reconnaissance Orbiter (MRO) took another image of Opportunity in Perseverance Valley that doesn’t appear to show any significant change at the site, which in turn would seem to indicate that the windy season has not really kicked up yet at Endeavour, or at least in Perseverance Valley where Opportunity is hunkered down. As it turned out, November was essentially “a repeat of October,” according to JPL Spacecraft Systems Engineer/Flight Director Michael Staab. 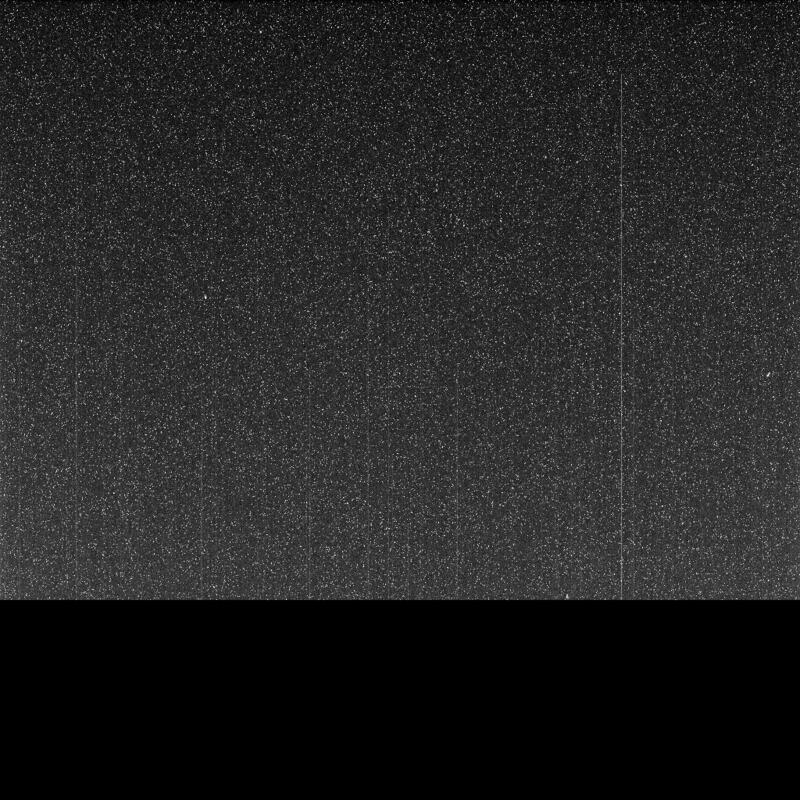 Signals that looked like they might be from Opportunity did pop up periodically on the DSN board throughout the month. “But they have all been false positives, mostly from MRO, and there isn’t a lot new right now,” said JPL’s Chief of MER Engineering Bill Nelson. The MER team didn’t hear from Opportunity in November, but the HiRISE camera onboard the Mars Reconnaissance Orbiter (MRO) did take another image of the rover in Perseverance Valley in November, to be released soon. The image shows little difference from this image taken on Sep. 20, 2018, according to MER science team members. The square highlighting the rover is about one kilometer (a half-mile) across. As November dawned at Endeavour Crater the atmospheric opacity or Tau over Opportunity’s site in Perseverance Valley was estimated from orbit to be at typical seasonal levels between 1.0 and 1.2, according to Bruce Cantor of Malin Space Science Systems (MSSS), who produces the weekly Mars Weather Reports with the Mars Color Imager (MARCI) camera onboard MRO. The monster planet encircling dust event (PEDE) that stopped the rover and the MER mission in their tracks in mid-June was officially deemed over in September. But the secondary or decay phase – wherein all the dust that was kicked high into the atmosphere settles out and down to the surface – lingered into the first sols of November. By the end of the first week of the month however, the Tau, as estimated from the MARCI orbital data and modeling by Cantor, had dropped to 0.8. Dust activity across much of Mars was “relatively uneventful,” and the sky over Endeavour Crater would be storm free throughout the month. The ops team continued planning as they have since Opportunity checked into hibernation. “We’re still building the plans so all the tools still flow and the team stays in the routine of operations,” noted Herman. Once Opportunity does phone home, if she does, the ops team assumes they will have to address a number of faults, including a mission clock fault, a low-power fault, and an up-loss timer fault, and they are well prepared for that. The MER science team has continued working too, even as most of the scientists have also worked on other missions and/or devoted time to things they put on the back burner. “As a science team, we are forging ahead,” said Fraeman. Arvidson started work in November on the draft for MER’s 12th mission extension, which is due February 14th next year and would keep Opportunity roving for three more years if the team succeeds in recovering their charge. “We’ve had some science discussions to help frame out the 12th extended mission proposal and to keep the morale up,” said Arvidson. The rover and her human colleagues would continue, of course, exploring Perseverance Valley, and then head into Endeavour Crater, as previously reported in The MER Update. “One of the insights is that we’re in the upper half of the Valley and if this was a valley where sediment was brought downhill, most of it should be at the bottom half, which we haven’t been to yet,” Arvidson noted. “Well that’s pretty exciting. So, we would probably continue down the hill, finish Perseverance Valley, get into the moat, and then keep driving up until the central mound,” he said. If you look down at the interior or the crater, imagine a horseshoe. Place the imaginary horseshoe with the rounded end on the southern side, and the would-be imprint of the horseshoe is where this bifurcating valley or moat is located. To clarify: this moat is not believed to be some ancient, water-filled remnant like those that surrounded old castles and fortresses in the days of King Arthur, but rather was likely excavated by wind. Mackenzie Day, who as a doctoral student at the University Texas worked on Curiosity and is now an Assistant Professor in the Earth, Planetary and Space Sciences department at the University of California Los Angeles (UCLA), published the wind excavation theory for a similar moat at Mt. Sharp, where Oppy’s younger cousin Curiosity, is working. 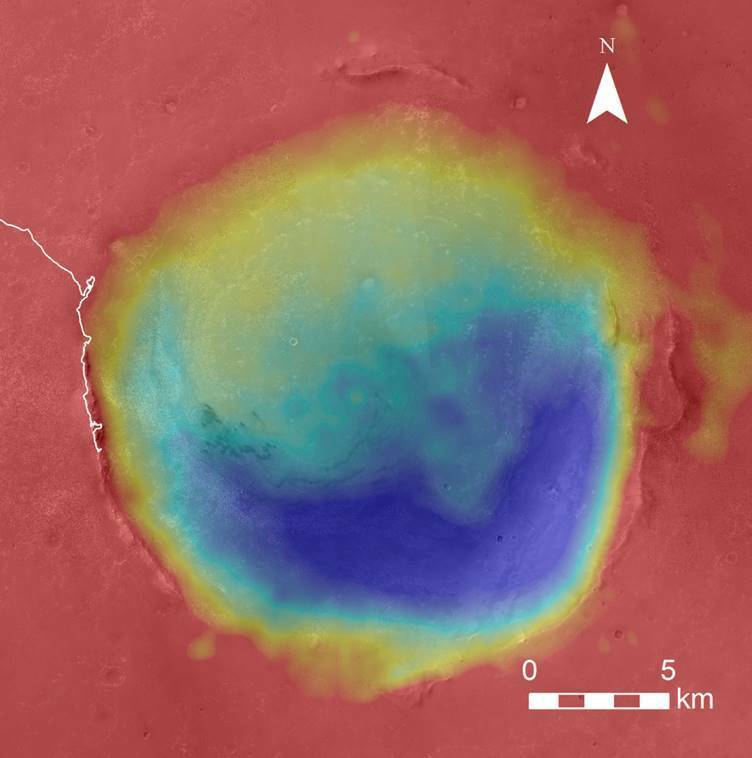 In essence, Day and her colleagues proposed that wind vortices close to the interior rim of Gale Crater, excavated the softer materials on the inside of the crater to form a moat and central mound. Their peer-reviewed paper titled “Carving intracrater layered deposits with wind on Mars,” was published in Geophysical Research Letters in 2016. “Although this paper is not specifically about Endeavour, it’s the same process,” said Arvidson. After transmitting this incomplete shot in June, Opportunity shut down, likely suffering a low-power fault, and went into a kind of hibernation to wait out the planet-encircling dust event (PEDE). With the storm over and a dust-cleaning season just beginning, the MER team still holds out hope they will hear from their rover soon. The MER proposal for a 12th mission extension then, as it is shaping up now, would finish off Perseverance Valley, the rocks, the structures, evidence for water alteration, and any potential deposits created by water flow. Then, once inside the crater, the rover and the team would conduct what Arvidson colloquially calls ‘Burns in a Bucket’ or ‘Burns in a Bowl’ to determine how sulfate-rich sandstones are generated in a bowl-shaped object, and in a crater that is 22 kilometers for Endeavour versus 150 kilometers for Gale, where there is also a section of hydrated sulfates, sulfate sandstones likely, on Mt Sharp. A number of signals that various mission followers believed were from Opportunity lit the Twittersphere in November, but they all turned out to be from another spacecraft. “MRO is our primary culprit,” said Staab. Remember, MRO has a spare Spirit radio that broadcasts on a channel that is very close to Opportunity’s channel. Since everyone thought that the MERs would both be gone by the time MRO arrived in orbit, the orbiter took with it one of Spirit’s spare radios. When MRO aerobraked into orbit and Spirit was still going strong, the teams had to work together to adapt to the unique issues around commanding Spirit. Basically, the problem was resolved with the creation of a commanding procedure that came to be known as the Mars Uplink Keep Out Window [MUKOW]. The term “keep out” refers to scheduling the DSN uplink to MRO to be turned off at an agreed-to time, to keep it out of the MER Small Deep Space Transponder (SDST) receiver when MER uplinking is required, and to scheduling the uplink to MER to be turned off to keep it out of the MRO SDST receiver when MRO uplinking is required, as Jim Taylor, Dennis K. Lee, and Shervin Shambayati explained it in a 2006 paper on MRO’s Telecommunications for JPL’s Deep Space Communications and Navigation Systems Center of Excellence (DESCANSO). “The scheduling was required as an agreement between the projects both for the projects’ planning purposes and because the DSN stations allocated to different projects are operated separately,” they wrote. These days, with the Doppler shift created as MRO moves around in orbit, “MRO’s signal can very easily look like Opportunity and people can get faked out,” said Staab. “So whether we’re listening passively or actively commanding, we get false alarm hits from MRO all the time. But we can tell very quickly whether it’s us or whether it’s the orbiter. I remember one incident in August that you covered where it appeared Opportunity was in lock and transmitting 6 megabits per second. Well, we knew very quickly that that was not us, because Opportunity’s maximum data rate on its X-band system from the surface is 28 kilobits not 6 megabits – that’s a big difference,” he said. 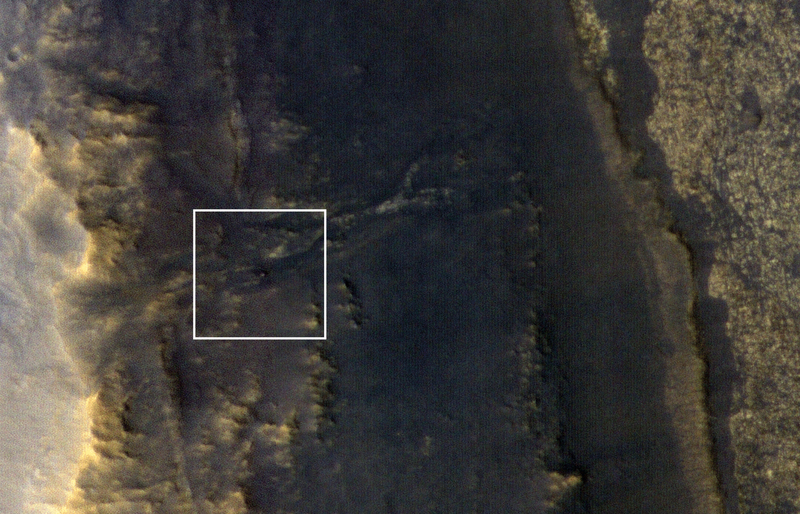 On November 25th, Principal Investigator of the High Resolution Imaging Science Experiment (HiRISE) camera onboard MRO Alfred McEwen, a professor of planetary geology and director of the Planetary Image Research Laboratory at the University of Arizona, distributed the latest orbital image of Opportunity and Perseverance Valley, reportedly to be released soon. This gif, from the HiRISE image of Opportunity shot in September, shows that dust on the floor of Endeavour was whisked away, leaving visible wind streaks, which indicated that there was visible wind activity at least on the floor of the crater. However, in the latest HiRISE image, those wind streaks are, according to MER Deputy Principal Investigator Ray Arvidson, still visible. That would indicate that the big gusts of the windy season did not stir things up at Endeavour in November. Given that the HiRISE images are taken from an altitude that varies from 200 to 400 kilometers (about 125 to 250 miles) above Mars, these orbital images do not have the resolution that enable the team, or anyone for that matter, to actually see Opportunity close up or detect how much dust may be coating her solar arrays, or even a reliable view of the amount of dust on the surface. 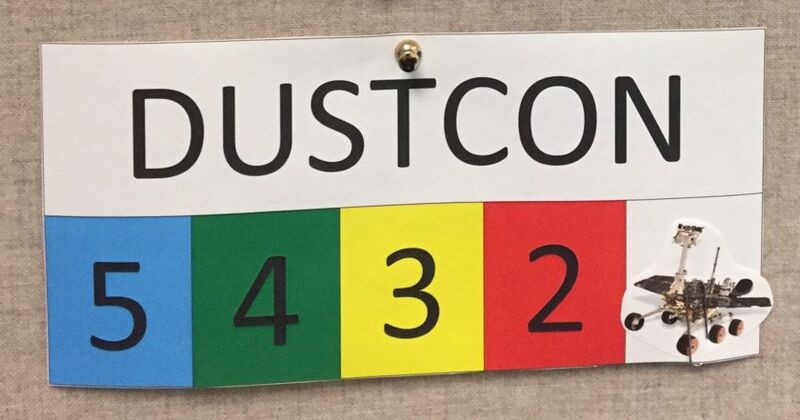 The science team meetings and the onset of the dust-cleaning season have buoyed the MER team’s inherent optimism. Still, “it’s been tough,” said Fraeman. “It’s easy to feel that with every passing day we haven’t heard from Opportunity, that something else is more seriously wrong, and that it’s going to be extremely difficult to recover the rover. We’re trying to be realistic. We really want to get the vehicle back, but we understand that MER is an old mission, and Opportunity is an old rover,” she said. “It is comforting to see the rover again,” said MER PI Steve Squyres in September 2018 when Opportunity was imaged by HIRISE. Author and astronomy outreach educator, Stuart Atkinson processed a closer-up version the HiRISE image (left). Opportunity is right in the middle of the image. 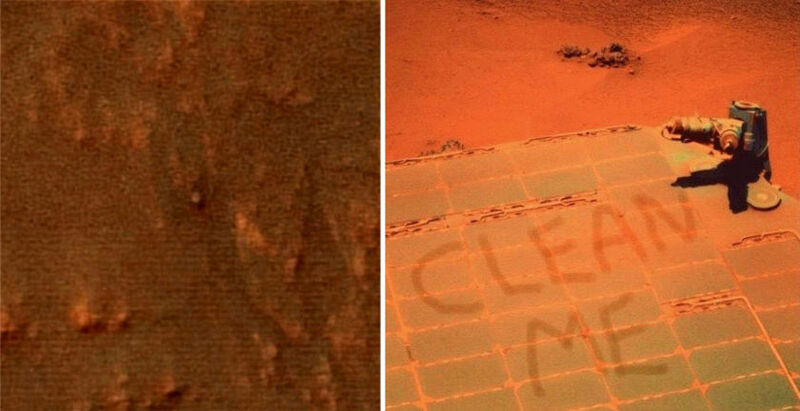 Searching for a little levity, he processed a solar array image the robot took some time ago, and then added the jokester plea seen on dirty vehicles around the world. See Atkinson’s The Road to Endeavour. Theoretically, the prospects for Opportunity phoning home still look good and the MER team has forever been fueled by its optimism and “a lucky star,” as MER Principal Investigator Steve Squyres called it way back when. It’s still summer at Endeavour Crater so the rover is not freezing past the point of no return, and the batteries should be resilient enough to be recharged, as reported in the last issue of The MER Update. Now if Mars will just whip up some gusts of wind to clear some of the dust from Opportunity’s solar arrays, the rover should be good to go, provided, of course, there hasn’t been a mission catastrophic event on the nearly 15-year old robot. Opportunity used her Pancam to take the self portraits above, in January 2014 (left), when her solar arrays was coated in the powdery Martian dust, and in late March 2014 (right) after the winds of Mars whisked off much of the dust from the arrays. As the MER team learned early on, as the Martian winds give, they also take away. In fact, the winds of Mars have enabled this robot to live long and prosper. The team is waiting now on the winds due to begin gusting through Endeavour, so that Opportunity can live to rove another day. No matter what happens, a little bit of MER lives on in all missions to Mars these days. Every planetary mission, especially landed missions on the Red Planet stand on the shoulders of the giants that went before them.“There’s a lot of MER experience that went into making sure InSight could be successful, which I think is pretty cool,” said Fraeman. It can’t happen soon enough. At this point, the MER team will keep on keepin’ on, with fingers crossed Mars steps up once again and delivers life-saving winds to Opportunity. Opportunity has been hunkered down about halfway down Perseverance Valley since June 2018 when a planet-encircling dust event (PEDE) forced her to shut down and go into a kind of hibernation, not far from where the rover took the image above. The MER team has been reaching out and listening for the rover’s signal ever since. By the end of September, the blanket of Mars’ rusty red dust that enveloped the planet had dissipated and the second, decay phase of the storm began as all the dust lofted high into the atmosphere settled back onto the surface. In October the decay phase ended, and in November the much-anticipated windy season began, giving MER team a sense of renewed optimism. The science team is currently charting the rover’s course for 2019 Phone home, Oppy! Thanks for the great article, I loved all the images and mission details. Hang in there Opportunity! Thank you for the current update. I hope this rover is recovered in a usable condition. Maybe the next solar power only rover can carry a spindle array of small gas containers underneath to extend up and level to the solar array to blow off the dust. To get the spindle array to work, a small antennae on the side of the deck would receive a command from an orbiter to have a separate underside processor open a circuit that would would use a separate battery to power the spindle array. The processor would have to have it's own contained battery which would be activated by remote command via an orbiter in the event of a PEDE or other large dust storm that may be spacecraft threatening. At the storms approach the signaling would initiate the use of the processors battery. The processor would await commands to start the cleaning attempt. The battery will not be connected for use to the spacecraft systems for any other purpose. General cleaning should not be done with this. That would be defeating the purpose of the Emergency Cleaning System. If it can be imagined then it can be done. I've said that before and I still do believe it.